Reduction of NH3 emission. Natural urease inhibitors acts as fertilisers in agriculture. Our innovative system is based on natural products loaded in polysaccharide beads for reducing ammonia emission in the environment by multi-target mechanism of action. Ammonia pollution comes from agriculture and livestock excreta represents a high cost to society, air pollution health problems. Ammonia is also recognized as a respiratory irritant for animals. – Urease inhibitors prevent the hydrolysis of urea, reduce NH3 emission and act as good fertilizer. – Efficient reduction of NH3 gas emission by controlling pH conditions. – Has an antimicrobial effect that reduces nitrogen combined hydrolysis and emission of NH3 gas. 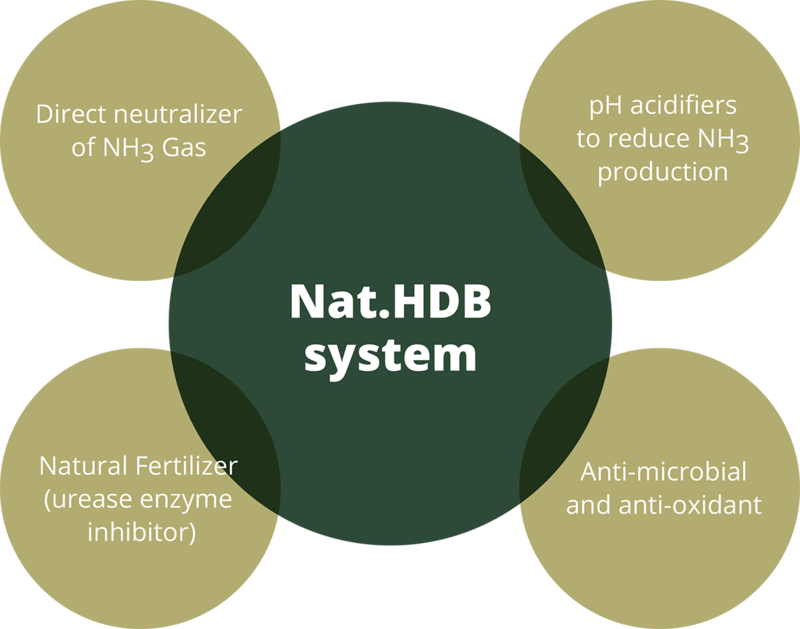 Nat.HDB System can help poultry and livestock producers to solve the problem of NH3 emission in their facilities. NAT-HDB-FA40: Feed additives to reduce ammonia emmision. NAT-HDB-M10: Manure treatment where animals are housed to reduce ammonia generation. NAT-HDB-UR: Effective Urease inhibitors fertilizers able to reduce ammonia generation in agricultura by prevention of urea hydrolysis.